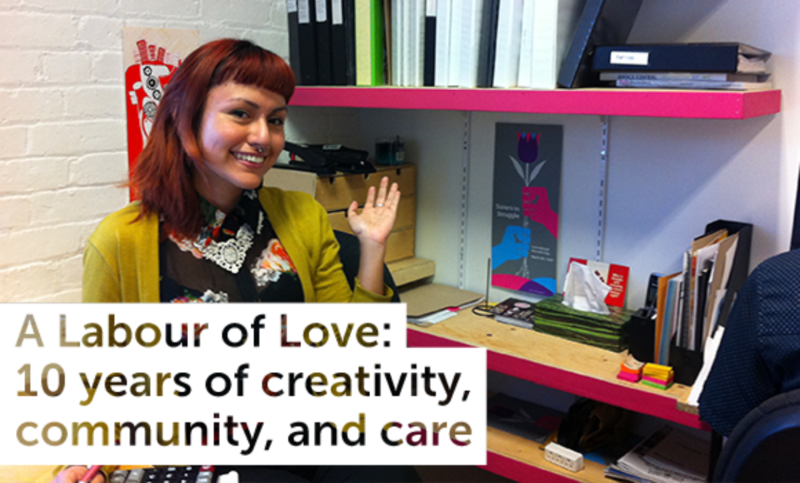 Welcome to our second edition of A Labour of Love: 10 years of creativity, community, and care, our special series of interviews celebrating the past decade of The Public! Each month we're sitting down with someone we've had the pleasure of working with over the last ten years to reflect on how The Public has impacted them. 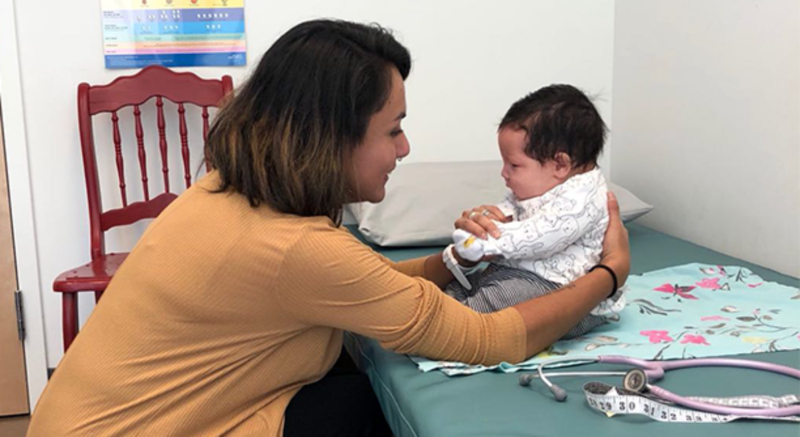 In this issue, we're chatting with The Public's first studio manager, Rocio Velasquez Guzman, who went from birthing The Public into the studio it is today, to welcoming new life into the world as a midwife. We talked about the ways we have and continue to commit to working with our communities in transformative ways. The Public: What was it like for you when you first started at The Public? Rocio Velasquez Guzman: I was bookkeeping for many grassroots organizations and community groups, and that work is something you usually do on your own. One of the things that was very different about The Public was that everybody was in the same room, and we had no choice but to collectively bounce ideas off of one another. It was really cool to witness the creative process and have input in it, even within my administrative position. We would have conversations about what the image looks like and why, what the message is behind it, and if it really does fit with the organization. I was an activist for a really long time before that who made pamphlets in Word, but learning how to actually convey a message and being part of that collective process was really cool. Also, getting to know your co-workers was something really new and eerie to me. I feel like now, there's thing of "open concept studios" or "organic design" that is conducive to team-building, but we were doing that before it was popularized. A lot of these times, these enclosed spaces where you have no choice but to actually be with one another creates this sort of mini community where you're really caring for one another, which was really sweet. TP: Were there skills you learned at The Public that you now find yourself using in your midwifery practice? RVG: As a midwife, part of my job is to talk to people a lot and to convey messages that are clear, concise, to the point, but also understanding of my clients' situations, social positions in the world, and access. I feel that the four years I worked at The Public definitely nourished the skill of how to listen well enough to know somebody's style of communication or what they're trying to convey, and how to incorporate that into your feedback, into your own communication skills. At The Public, clients would bring their summary of what they wanted, and we would have to translate it into this visual idea. In my practice for example, it's a lot like that. People bring their ancestry, their ideas of what birth will look like, and then I have to translate it into a clinical picture and what makes more sense in the moment. Those are really big skills that I don't think I would have been so comfortable with, but I feel like I'm confident in that because I had years at The Public of really learning that servicing community, and listening to their needs are processes that take time and dedication. TP: What were some of the biggest lessons you learned office managing The Public? RVG: I learned to build my political analysis around what it means to be a lucrative business in a capitalist society while also having politics that are more radical than that. I mean, we all want the abolition of money and capital, but what do we do in the meantime, when things are just still terrible? It was about finding that balance, of having our message be consistently radical, while offering for both our students and workers living wages, and providing more ethical internships and freelancing. That was something that was really clear as we expanded the practice, working on caring for the community in ways where we could channel whatever money that was coming in to us to the rest of our people, but also to know that there is this tension that we live in. This capitalist world—we have to get paid, but also how do we stay radical and relevant to the community? As a midwife now, inside the provincial healthcare system I struggle with this question all the time, but I feel way better equipped to have these complicated conversations, and to ultimately work for a better world. I realized I stayed with The Public, because the work was really what I, not just believed in, but what felt tangible as a community project that was also financially stable. So, in January of 2011, when we were going to shut down The Public, I remember feeling very personally attached to this space, and truly attached to the message and the radical capacity that wasn't really there yet. It was that feeling of what The Public could be—which I actually see now—that led Sheila and myself to be like "Okay, we're going to make a decision to not shut down The Public. We have $25 in the bank account, but it's going to be fine, we're just going to get more jobs and figure this out." I think it was because we both saw how this could be a project that was radically aiming for living working conditions and radical service to our communities. We realized that through the studio, we could offer opportunities, like for example having a Junior Designer joining the practice, not having finished their degree just yet, but having the skills and having the capacity, and offering a living wage for interns to help us out in rebuilding The Public. This really has been a true labour of conviction and political belief. It wasn't the first or only time that we didn't have money in our bank account, but it was also a moment where we could re-envision and ask "How can we be held by community, but also at the same time create a different system?" We're not a "socially-conscious design studio," we are a radical design studio specializing in changing the world, so what does that really mean? What makes us different? I think that was a really good moment to go back to the drawing board to focus on community building and offering opportunities for skill building within our communities. When we started to get some money to pay ourselves and when we saw such an amazing influx of the community coming to us for work, we decided to give back. Resources like our People's History posters, for example, are a creation really borne out of our desire to give back to the community something that is both beautiful and that speaks to our politics. One of the things that I'm really proud of is that one of our visions was to always visually give back to the community with our work, but also have a presence within a community, supporting local artists. When The Public moved last year to a place with a storefront, it was really amazing. It felt like almost the culmination of our early dreams for the studio that we've had for a long time, and now we're moving towards that vision. TP: Thanks for speaking with us today and for always believing in The Public, Rocio!